The first disaster came early. Our farming attempt started out hopefully – what can be more hopeful, after all, than tiny green things poking out of dark earth, the first sign of life (not to mention the potential for our food and income)? But unfortunately this storybook scenario wasn’t taking place in Spring. Were it Spring, maybe our proto-farm would have had a better chance at harnessing some beginner’s luck. 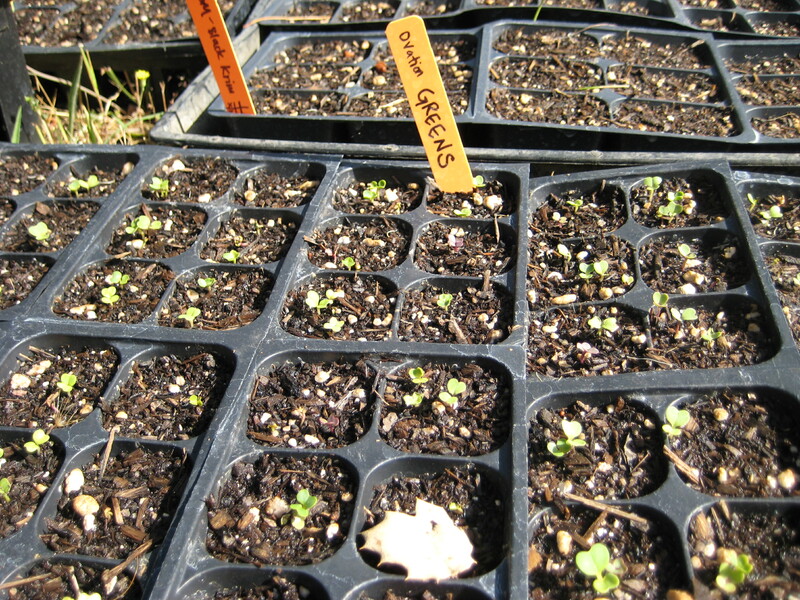 No, tragically, our tiny green seedlings were getting a late start in life: a May start, a hot start, a scorching 100-degree welcome-to-the-world-and-good-luck-to-you start. At this point, I still hadn’t yet arrived at The Patch. I was in Southern California, visiting family and farming vicariously. I heard the news over the phone that the seedlings were dead. Since I hadn’t been living and breathing the chaos – while I was surfing, Emmett was trying to locate cheap organic manure, ready the ground, lay the framework for irrigation, oh, and coax seedlings to life in 100-degree and zero-humidity weather – I was understandably miffed. I’d been a strong supporter of extravagant seed purchasing. Ten types of tomatoes? Five of winter squash? Lacinato kale? Quinoa? Sure, go ahead! The more the merrier. $150 at Seeds of Change? $120 at Johnny’s? Be my guest. As Emmett cringed entering our credit card number yet again, I was by his side murmuring Remember, honey, it’s an investment. And although I knew that we were a bit out of season, deep in my heart I always assumed that the investment would pay off. Or, if not pay off, at least not wither and die before ever making it into the ground. Because The Patch was just a stretch of dry, dusty clay (with no useful things like faucets) when he arrived there, Emmett had planted the seeds in a couple hundred of those black plastic six-packs. We figured, better to get our little babies in the dirt growing as soon as possible. The beans rotted. As in, some of the seeds never emerged; a post-mortem revealed that they had simply disappeared, composted in-situ. Only two out of 216 survived. The trauma left them stunted, and the ultimate survival of those two warriors is still unclear; their directly-sown counterparts now tower above them and may shortly shade them out. If the beans were a fast massacre, the 330 tomatoes were a slowly-spreading epidemic. Some of them died quickly but many of them lingered, cruelly prolonging hope. After six weeks, we have one tomato that might be tough enough to go into the ground in, say, 14 more days. That’s if we’re lucky: the biggest one is currently a whopping 2.5 inches tall. As our spindly, root-rotted tomatoes staunchly refused to don a second set of leaves, it was suggested by Emmett’s dad (kindly) that we go out and buy some seedlings from a nursery. We bought 80 tomatoes for $1.12 each, and they’re currently the healthiest looking thing at The Patch. They might be flowering a bit early, but they’re still growing briskly and pumping out runners like mad, which we are dutifully plucking as we train them upwards, vine-style. Squash proved hardest to kill. We managed to eke three 60-foot out of the squash and melon seedlings. (We also saved half a row’s worth of cucumbers.) Still, we’ve learned the hard way that squash don’t really like being transplanted; the squash we planted directly in the ground is bigger and healthier looking than the transplants (which are several weeks older). Other casualties: 550 cells of (multiply planted) lettuce. 24 basil, 24 cilantro, 12 sage, 12 dill, 24 chives, 24 parsley. For a while we had one fabulous little healthy-looking dill plant which thrilled us. Our pride and joy got scorched in the plastic house on a 100-degree day, and ended up compost.